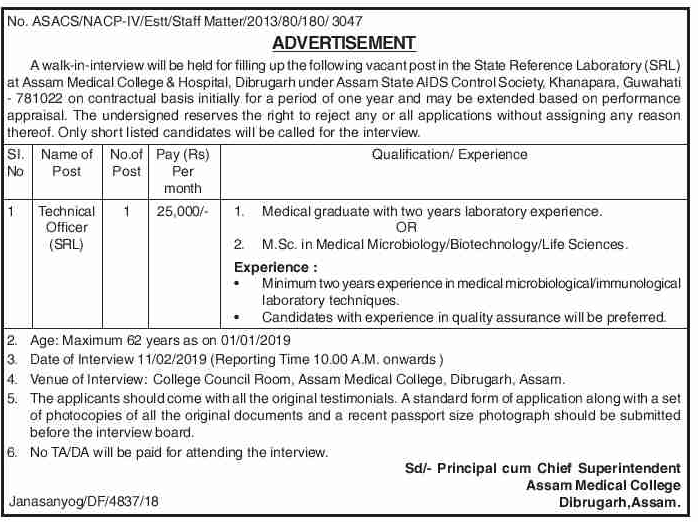 A walk-in-interview will be held for filling up the following vacant post in the State Reference Laboratory (SRL) at Assam Medical College & Hospital, Dibrugarh under Assam State AIDS Control Society, Khanapara, Guwahati- 781022 on contractual basis initially for a period of one year and may be extended based on performance appraisal. Educational Qualification: Medical graduate with two years laboratory experience. OR 2. M.Sc. in Medical Microbiology/Biotechnology/Life Sciences. Experience: Minimum two years experience in medical microbiological/ immunological laboratory techniques.Candidates with experience in quality assurance will be preferred. How to apply: The applicants should come with all the original testimonials. A standard form of application along with a set of photocopies of all the original documents and a recent passport size photograph should be submitted before the interview board. Venue of Interview: College Council Room, Assam Medical College, Dibrugarh, Assam.